I am so appreciative of all the teachers out there that have made my job easier through guidance and support. I am so appreciative of all that you do to make learning fun for kiddos all over the world! I am so appreciative off all the teachers and visitors that come to visit me here in the Science School Yard...I sometimes wonder if there is anyone out there...TPT is celebrating you and so am I. Please help me celebrate! The rules are simple! Leave a comment below this post with your email, and I will randomly choose 2 winners for a $10 TPT Gift Card. One gift card per day for Tuesday and Wednesday's Sale. Easy! Winners will be chosen by noon 5/4. Shop at the Science School Yard TPT Store for great science lap books, FOSS extensions, STEM activities, and more. K-5 Science is what I do best each and every day! Thanks for stopping by! Don't forget that everything in my store is 20% off May 3rd and May 4th! 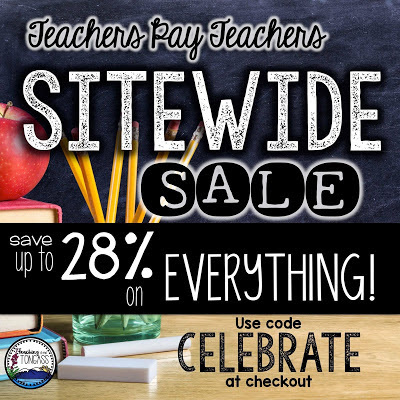 With an extra special TPT code CELEBRATE that will give you additional savings at the check out! Congrats to Tess for winning the first gift certificate. Name sorter sure does help. Thanks again for everyone that has stopped by!